Peatlands are globally significant sources of atmospheric methane (CH4). 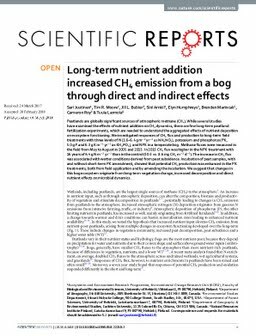 While several studies have examined the effects of nutrient addition on CH4 dynamics, there are few long-term peatland fertilization experiments, which are needed to understand the aggregated effects of nutrient deposition on ecosystem functioning. We investigated responses of CH4 flux and production to long-term field treatments with three levels of N (1.6-6.4 g m-2 yr-1 as NH4NO3), potassium and phosphorus (PK, 5.0 g P and 6.3 g K m-2 yr-1 as KH2PO4), and NPK in a temperate bog. Methane fluxes were measured in the field from May to August in 2005 and 2015. In 2015 CH4 flux was higher in the NPK treatment with 16 years of 6.4 g N m-2 yr-1 than in the control (50.5 vs. 8.6 mg CH4 m-2 d-1). The increase in CH4 flux was associated with wetter conditions derived from peat subsidence. Incubation of peat samples, with and without short-term PK amendment, showed that potential CH4 production was enhanced in the PK treatments, both from field application and by amending the incubation. We suggest that changes in this bog ecosystem originate from long-term vegetation change, increased decomposition and direct nutrient effects on microbial dynamics.